⇒ It is increasingly getting difficult to focus on use of fossil fuels & on keeping a environmentally sustainable economy. ⇒ In such a case, Biomass can act as the best possible alternative to the present problem. 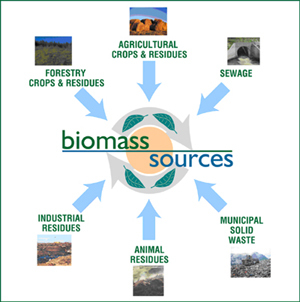 ⇒ Biomass is a natural resource derived from plant based materials. ⇒ It comprises of a mixture of organic molecules containing carbon, hydrogen, oxygen, nitrogen & small quantities of Alkali, alkaline earth and heavy metals. ⇒ Biofuel is a type of fuel produced from plants. ⇒ It can be used in the same way as the normal petroleum fuels. ⇒ But it has various problems like lack of investment, lack of technology & extraction methods, etc. ⇒ India is a biomass rich country. ⇒ Presently, it is used mostly by the rural population. ⇒ Total share of biomass in total primary energy usage is 32% in India but it is used by more than 70% of the population. ⇒ Efficient use of Biomass can lead to socio-economic development. ⇒ Biomass can be converted to various other forms. ⇒ Biomass can be converted into energy directly (in the form of heat or electricity) or to other forms such as liquid biofuel or combustible biogas. ⇒ Biofuels derived from sustainable bio-resources is the emerging area (can help to create good environment, develop rural economy & generate employment). ⇒ It can also be converted into a wide array of value-added products. ⇒ To study the potential of an area & formulate policies for the same requires proper understanding of the availability of the same. ⇒ An unique knowledge networking institution – Technology Information, Forecasting and Assessment Council (TIFAC), worked under the Department of Science & Technology (Government of India) & carried out the required study. ⇒ In the survey carried out both quantitative (actual production of biomass in India in terms of quantity) & qualitative (quality of the biomass in India) aspects were focused. ⇒ The overall assessment for the surplus biomass resources was based on estimation of the quantity of crops produced, crop residues generated and their existing utilization patterns/practices in the area. ⇒ The major crop producing states according to the survey are Andhra Pradesh, Assam, Chattisgarh, Haryana, Himachal Pradesh, Madhya Pradesh, Maharashtra, Orissa, Punjab, Tamil Nadu, Uttarakhand, Uttar Pradesh, West Bengal, etc. (not necessarily in the order of production). ⇒ Thanks to agriculture being the most important economic activity in India, generates great amount of Biomass. ⇒ Processing of agriculture produces also produces substantial amount of biomass. ⇒ Crops considered by TIFAC for survey: 14 crops namely rice, wheat, sugar cane, maize, cotton, chili, jowar, ragi, bajra, pulses(gram, tur, lentil), oilseeds (groundnut, mustard, sesame, safflower, linseed, niger seed, castor seed, soybean and sunflower), forestry biomass (bamboo, pine needles), aquatic biomass (Water hyacinth), etc. ⇒ According to the survey, India produces a total of 623.4 Million Metric Tons (MMT) of Biomass residues. ⇒ Rice straw and husk, wheat straw, sugarcane tops and bagasse account for almost 80% of the residue generated by the crop. 1. Rice Straw & Husk 1. Every ton of paddy produces 1.1 – 1.3 MT of straw and 0.23 – 0.25 MT of husk. 2. Wheat Straw 1. Every ton produces 1.4 to 1.5 MT of straw. 3. Sugarcane Top portion of sugarcane (removed during harvesting) & bagasse from sugar mills 1. Every ton of sugarcane produces 0.25 -0.30 MT of sugarcane tops & 0.27 – 0.30 MT of wet bagasse. 4. Maize Stover, Cob & Silk 1. Every ton of maize produces 1.5 MT of stover, 0.25-0.30 MT of husk, silk, etc. 5. Cotton Actually the entire plant is residue as only the cotton is plucked 1. 2 MT of cotton stalks per hectare. ⇒ Biomass is used as an animal feed. ⇒ It can be used for making fertilizers i.e. compost. ⇒ It is widely used as a household fuel in rural areas. ⇒ It can also be used to make fuel for domestic and industrial use. ⇒ When biomass is burnt as it is, it produces atmospheric aerosols and trace gas. It emits Carbon Dioxide, Carbon Monoxide, Methane, volatile organic compounds (VOC), nitrogen oxides and halogen compounds. ⇒ It has a major effect on climate and human health. ⇒ Reasons for burning as it is: i) Unavailability of Labour ii) High cost of removing the residues iii) use of combines in rice-wheat cropping system especially in the Indo-Gangetic plains. ⇒ If biomass has to be used for long term projects the long term availability of biomass should be there. ⇒ Also, various other related facilities like storage, transportation, etc. are not available for them. In this case collection centres can prove very helpful located at various places. ⇒ Proper pre-processing techniques should be available so that it’s density can be increased before it is transported. So that transportation becomes cheaper. ⇒ Farmer co-operative societies can help a lot in collection of biomass. ⇒ We lack proper coordination between the private & government sector on this. ⇒ Also, proper infrastructure for the same is not present nor is there any provision for it in the budget. ⇒ Biomass in India is already not available as fodder for animals. It is unlikely that it can be made available for use of it as biofuel. ⇒ More focus should be given on non-fodder crops for biofuel purposes. ⇒ Proper education about the same should be given to the farmers by various government schemes & programs. ⇒ It can thus save a lot of precious foreign currency. ⇒ If biomass is focused it can act as a game changer for the rural economy. It can be made self-reliant. ⇒ It will also generate enough employment in the rural areas. ⇒ Various biotechnology projects of focused on increasing the biomass generation capacity of plants should be given proper attention. Greenwich Meridian, considered as the central Longitude (0/Zero Degree Longitude), is named after the city of Greenwich. In which country is this place located?